I am privileged to pen a few words on the life and works of Sir Razik Fareed. A.R.A. Razik (then known as) the laird of Layards Broadway was born on December 29, 1893 at Layards Broadway, Grandpass, Colombo. His father was Abdul Rahman who represented the Ceylon Moors in the Legislative Council in 1900 to 1916. His grandfather was Wapche Marikar who was a philanthropist and a great builder. Sir Razik Fareed was first educated at Madhrasathul Zahira and later at Royal College. He was married to Zubede Amina daughter of Ibrahim, Merchant Prince of Yemeni Arab descent. He gave up his early life and ease and comfort and girdled himself to serve his country and community. His grandfather and father had done distinguished service to their brethren. It was fitting that the only male in the third generation should follow their footsteps. He won the New Bazaar Ward of the Colombo Municipal Council in 1931. On March 17, 1936 he was nominated to the State Council as an accredited representative of the Ceylon Moors. On October 16, 1947 he was elected a Senator. Even though the Senate enjoyed precedence, it was no place for a popular leader who commands the respect and admiration of the community. Thereafter he resigned from the Senate on April 25, 1952 and contested the Colombo Central Seat in Parliament and won. He retained the seat at the elections held in 1956 and July 1960. In 1965, he was nominated to Parliament. In recognition of his service to the country and community he was made a Justice of the Peace and Unofficial Magistrate in 1932. Sir Razik was conferred the Imperial Honour of MBE in 1948 and made a Knight Bachelor in 1951. He was not only a Senator and Parliamentarian but he was also Deputy Speaker, Minister and an Ambassador. Sir Razik's contribution to education was remarkable. He spent his wealth on education and donated a building for the Muslim Ladies College at Bambalapitiya, Colombo. He worked hard to establish Government Muslim Schools throughout the Island, set up Muslim Training Colleges and a separate Unit for Muslim education. It was due to his efforts that Moulavees and inspectors for Arabic were appointed to Muslim Schools. Sir Razik's name will always be remembered as the Father of Government Muslim Schools. Interalia whilst paying a tribute to Sir Razik Fareed no less an eminent and erudite scholar than A.M.A. 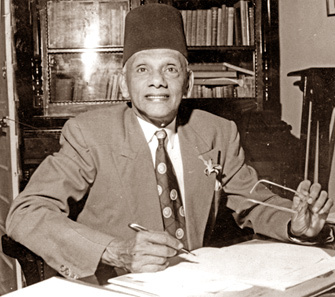 Azeez, C.C.S., Founding Father of the Ceylon Muslim Scholarship Fund and the YMMAs in Sri Lanka and then Principal of Zahira College, Colombo quoted "As an humble votary of Clio, a mere but diligent student of history, I would venture the prediction that Sir Razik Fareed will be remembered by generations unborn, that he will live in the history of our country as the "Father of Government Muslim Schools." To give political leadership to Muslims, he made use of the All Ceylon Moors' Association of which he was the Life President till his demise in the year 1984. He was able to open over 300 branches of the All Ceylon Moors' Association in every part of the island, personally visiting these areas. In the year 1970, he donated a valuable piece of land to the All Ceylon Moors' Association at Aramaya Place, Beseline Road, Colombo. The establishment of the Moors' Islamic Cultural Home is another landmark of his activities. He was one of the founding fathers along with W.M. Hassim, JP., A.H. Macan Markar, A.I.L. Marikar and A.L.M. Lafir, JP., on August 2, 1944. He was the President since inauguration till his demise. Sir Razik toiled hard for the emancipation of the common man irrespective of caste, creed or race. He was in the forefront of religious, social and cultural revival of Muslims in particular and in Sri Lankans in general. He was also a freedom fighter. Sir Razik was born with the proverbial silver spoon in his mouth but this did not prevent his rapport with each and every individual. He was a strong believer in a united Sri Lanka. His sincere hope was to foster Yonaka-Sinhala unity. Sir Razik will remain a legend for all times in the history of the country. He was also known as the Uncrowned King of Ceylon Moors. Sir Razik had the privilege of his grand parents and seeing his great, great grandchildren. This is either a world record or a rare achievement. Appointments of Muslim Teachers, Moulavees and Inspector of Schools for Arabic. He introduced the First Muslim Reader for primary classes and declaration of Meelad-un-Nabi Holy Prophet Mahammad's Birthday as a National Holiday, obtained ratio for Ceylon Moors in matter of appointments to Government Service. He also obtained recognition to Unani System of Medicine. Like his grandfather Wapche Marikar, a philanthropist, Sir Razik followed his footsteps and there was nothing left for him when he breathed his last. Even his wife's property with a large extent and a building was donated to the Moors' Islamic Cultural Home which runs the Lady Fareed home for elders at Makola in the Kelaniya Electorate. Sir Razik breathed his last on August 23, 1984 - Inna Lillahi Wa Inna Ilaihi Rajioon. Not a single Muslim could help but to shed a silent tear at the passing away of this colossus of a man. His Janaza, after prayer at the Colombo Grand Mosque was carried to its last resting place at 'Pasha Villa' MICH, Dematagoda, a place which was near and dear to him. Sir Razik Fareed led the Moor community in the correct path. Though Sir Razik Fareed is no more his name will remain for ever in the minds of generations to come. He was always best dressed in his China or Waist Silk Suit with the orchid in his button hole and the fez cap. Kathmul Quran is recited annually at his grave-side at 'Pasha Villa' on his every Birth and Death Anniversaries. This is organized by Sir Razik Fareed Foundation in conjunction with the Moors' Islamic Cultural Home.